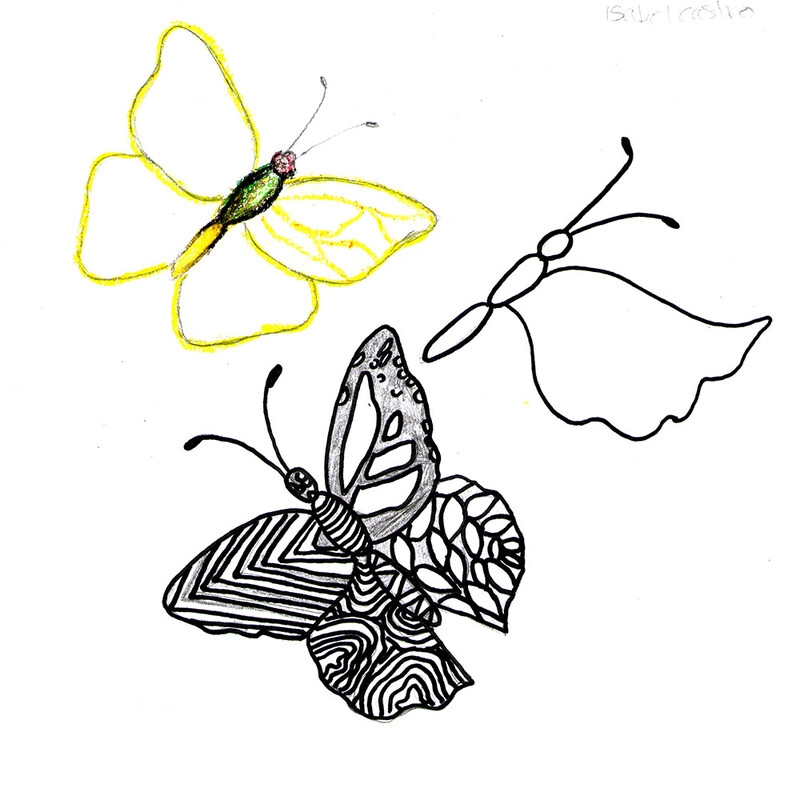 Once the students finished researching and drawing a variety of native crops and migratory species of butterflies that live in Wisconsin, we (Gabi and Jenie) got together to collage them together into a final composition. creating a plan that made good use of the space and was practical for our supplies budget and time frame. We estimated 4 painting days and $800 for the mural supplies. You can see the breakdown of our supplies here. 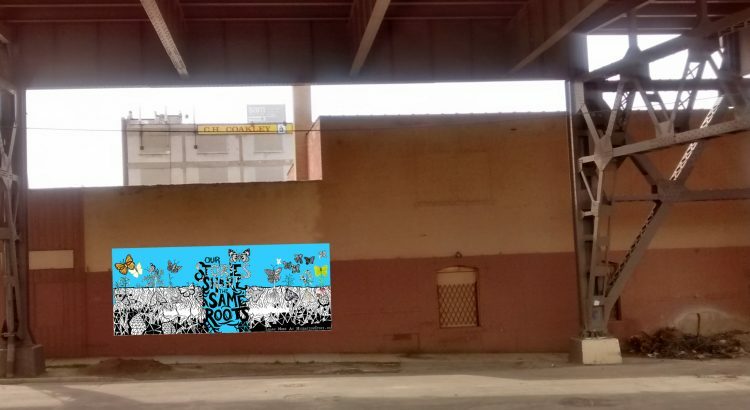 Here is the final mock-up of our mural. Now we were ready to get supplies and start painting. 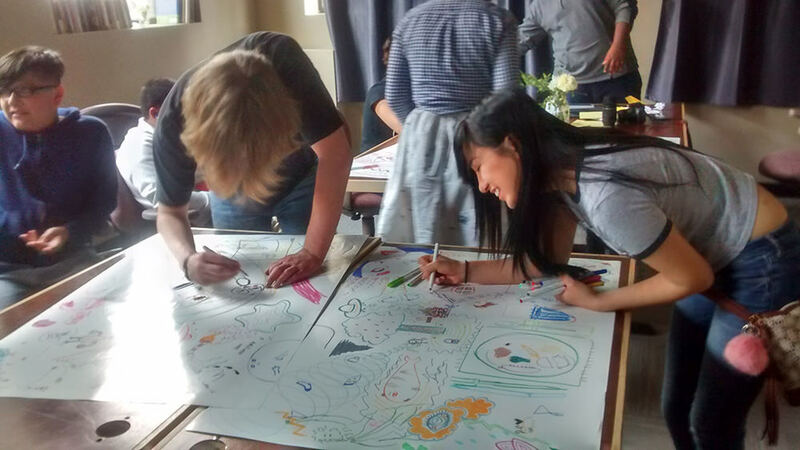 The students’ and instructors’ drawings collaged together in Photoshop for the final design, to be 12 x 30 feet. We divided the design into 24 5×3 foot panels, the size of the cement boards we would be using. The plan was to set up a workflow with a projector for each of the panels and then space on the ground and floor to finish painting and detailing each panel. Final text design by Jenie Gao. 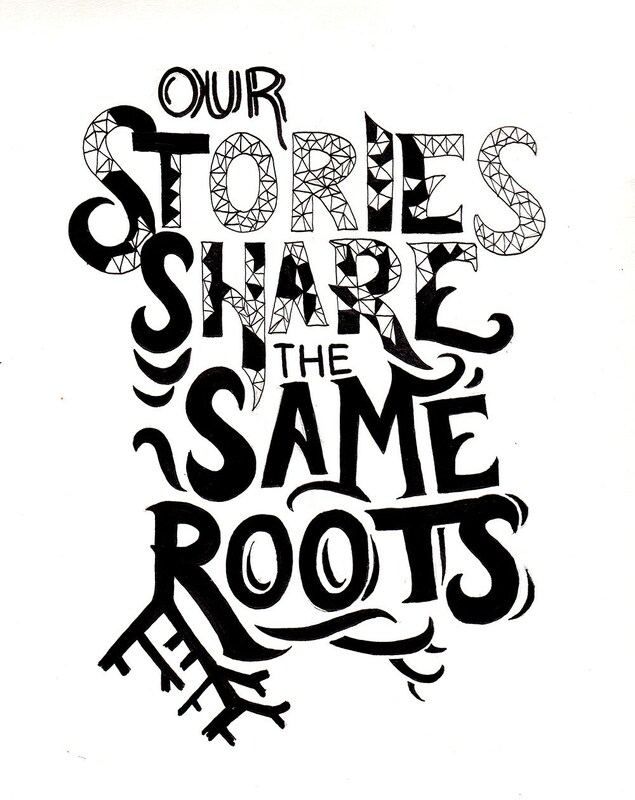 We came to a consensus on the words, “Our Stories Share the Same Roots,” to drive the message of our mural. Photoshop mock-up of the location and scale of the mural once installed on the building. 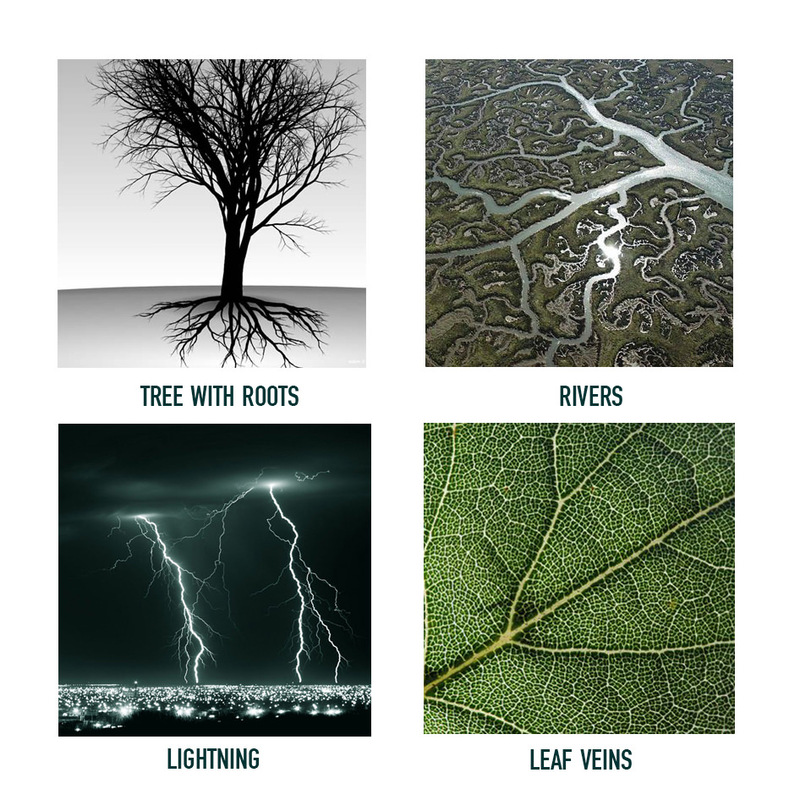 Our top question: How do you create an image to match your image with your message? 1 workshop focused on Image Composition. We studied examples of different techniques artists used to weight or draw the viewers’ focus through the piece. We created our own compositions from still life objects. 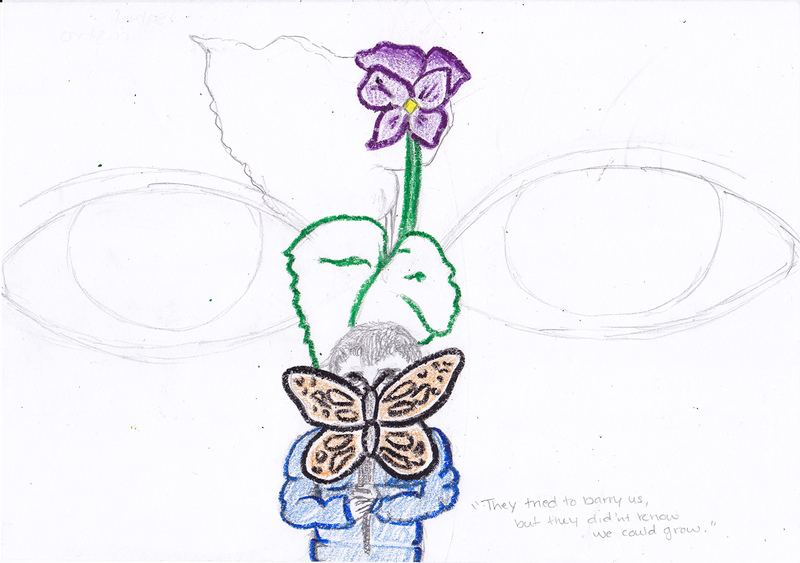 Each student received two objects to use as reference and had to try and come up with a composition that conveyed an “opposite” sense of what the object was. 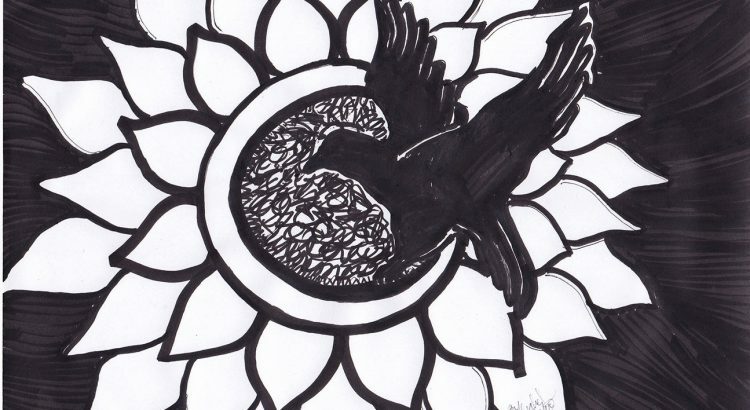 How do you draw a feather to look heavy? A small bauble to look large? A stable, symmetrical container to look off balance? Here are some of the results. 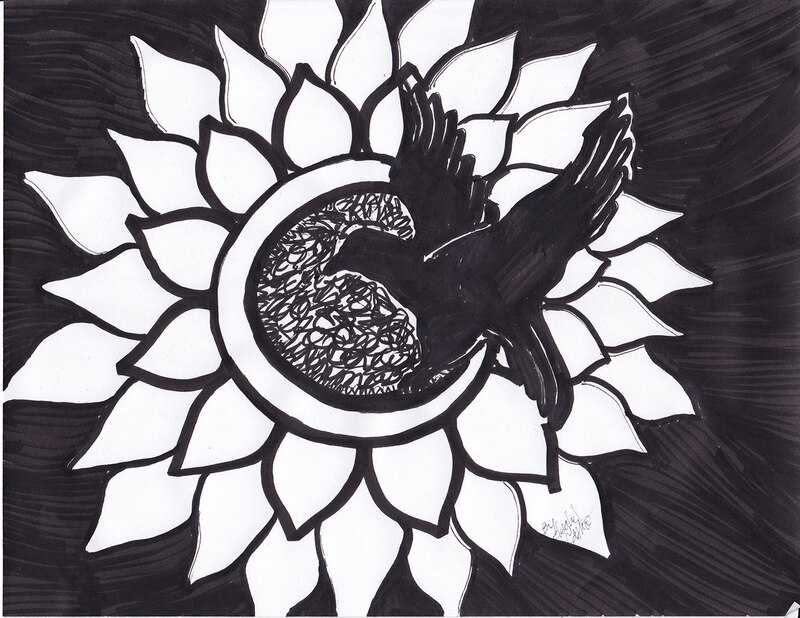 Drawing using a a sunflower and eagle brooch for reference, by Isabel Castro. 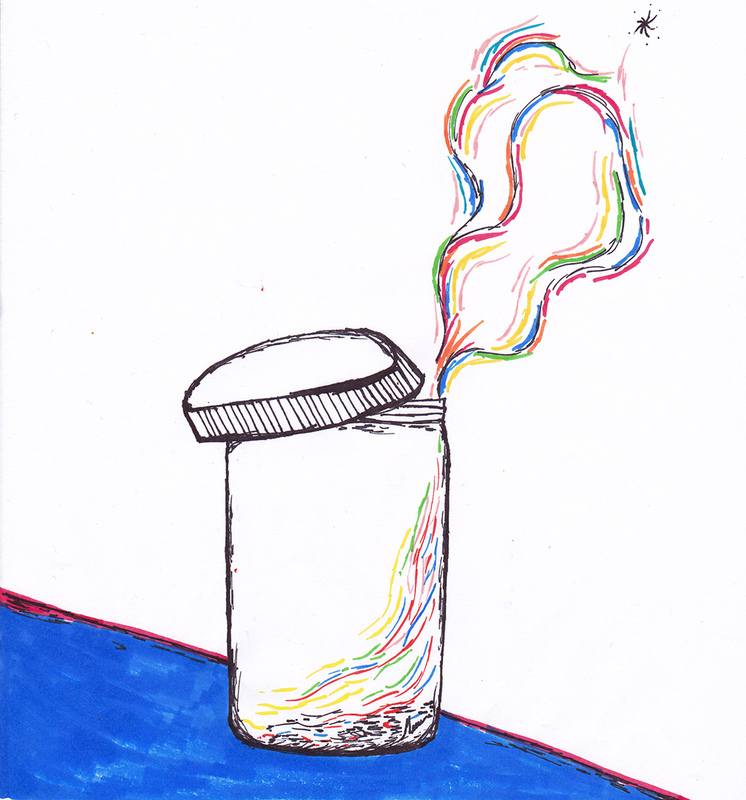 Drawing of a jar on the edge of the table, by German Vasquez. Researching different subjects related to our theme of immigration. 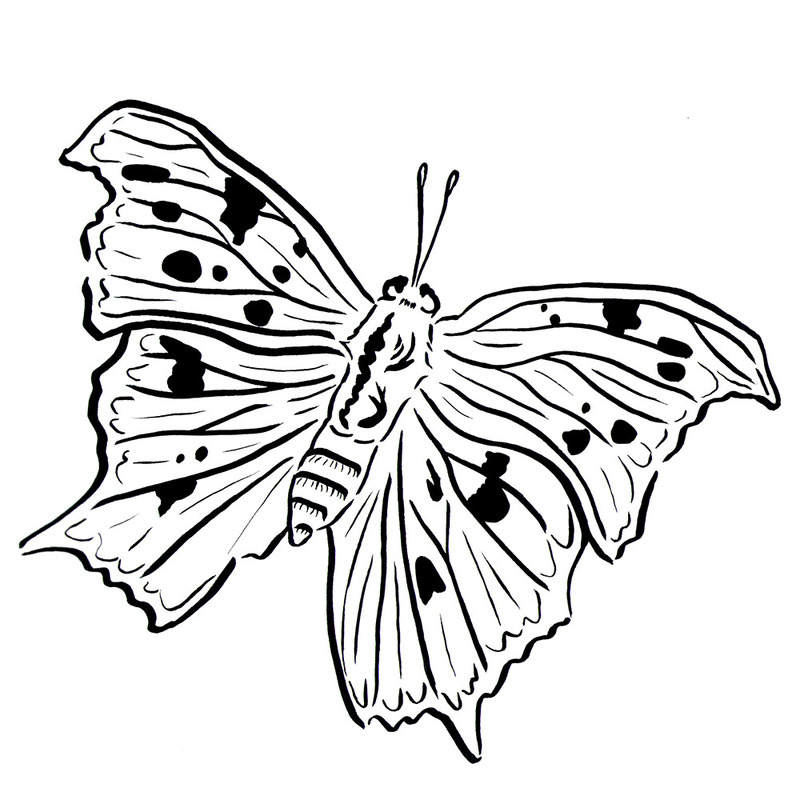 We ultimately chose to incorporate different migratory butterflies and crops that are grown in Wisconsin into our final imagery. 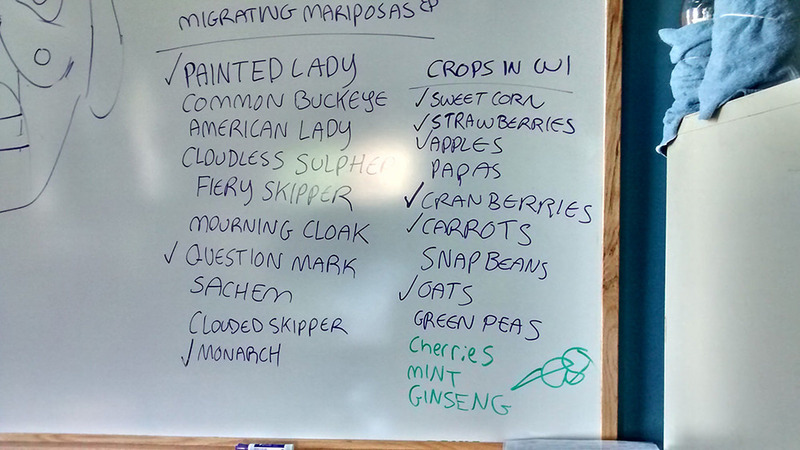 Our list of different migratory species of butterflies and crops that grow in Wisconsin. 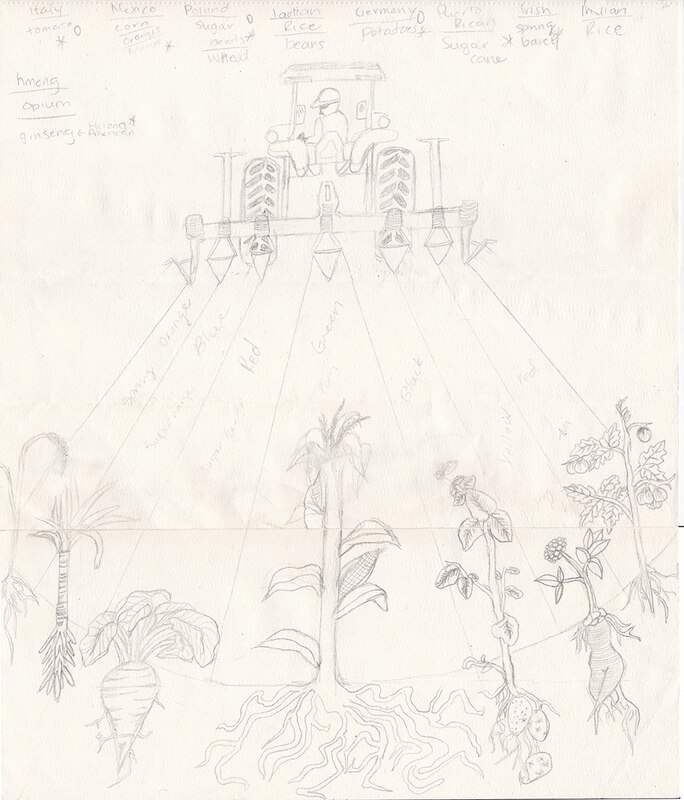 One of the students’ thumbnail sketches of different possible compositions. 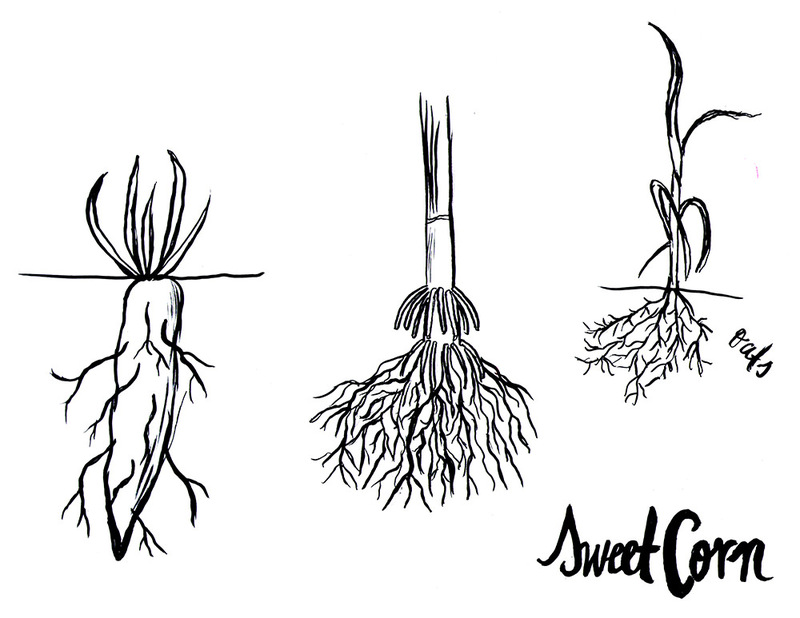 A composite sketch by student Isabel Castro of crops grown by different cultures in Wisconsin, with different roots. Talking about our concepts is one thing. 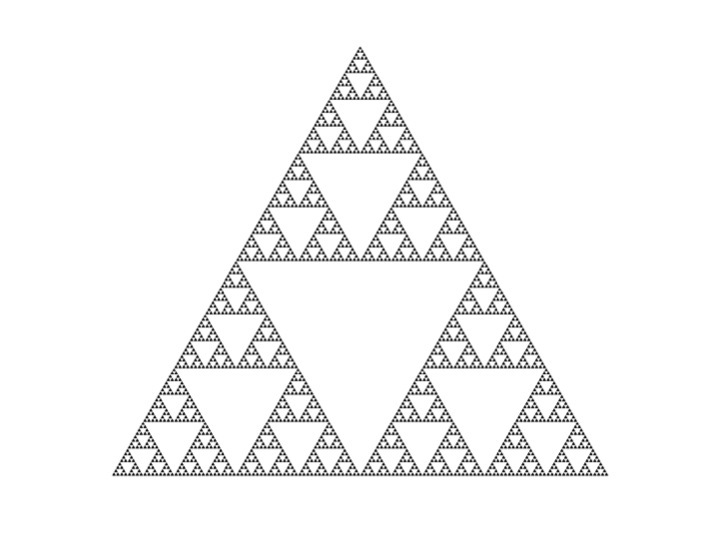 But how do you translate words into image? Where do you even begin? We spent a day exercising our creative chops and spontaneity. We started with the improv game, “Yes, and…” Good improvisation depends on trust, and the purpose of the game is to foster collaboration. The rule is that whatever your partner throws down as a prompt, you follow with, “Yes, and…” to continue building the scene. If you disagree with your partner and kill their prompt, you effectively end the scene and the story. 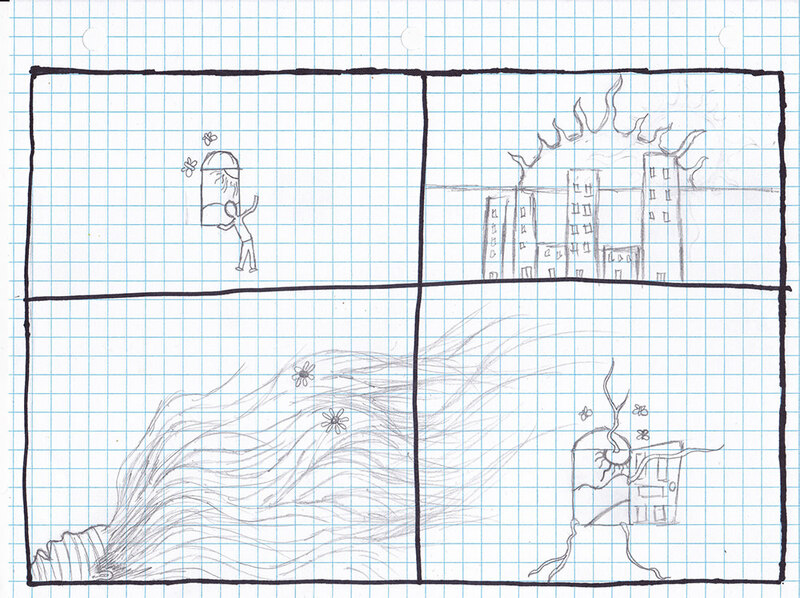 Translating that same idea into image, we played the drawing game, Doodle Wars. 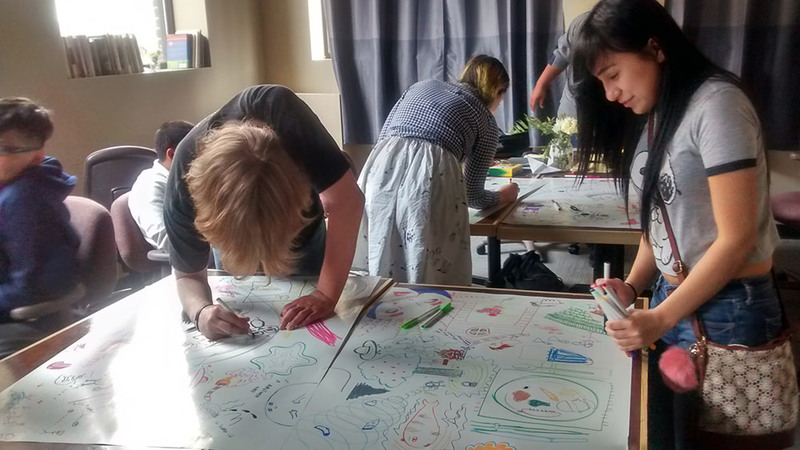 Everyone draws on the same large sheets of paper, and every minute, a timer goes off and you have to move to another spot and create a new drawing in response to what somebody else has already put down. The goal is to be quick, keep moving, and keep expanding upon the scenes that already exist. 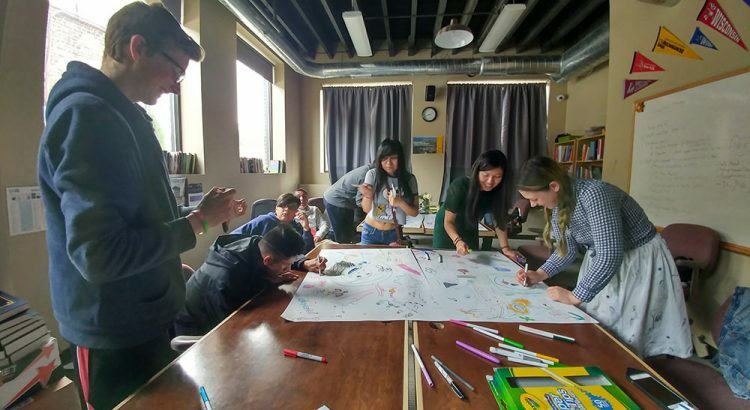 We dedicated a few of our workshops to the role of the arts in social movements. 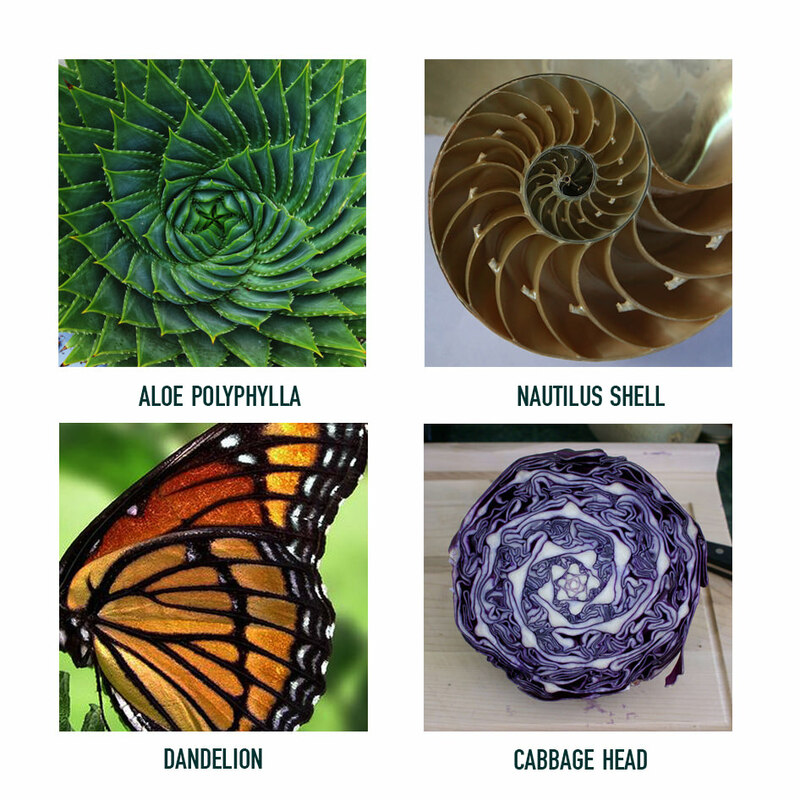 Here are some of the examples from our classes. 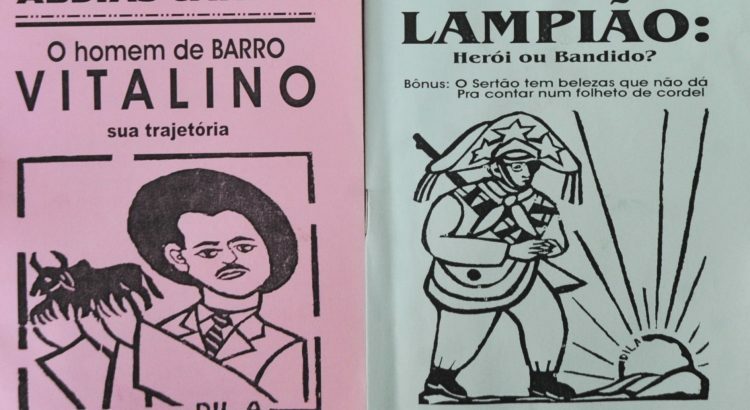 These are inexpensive booklets sold at fairs and by street vendors in Brazil. They cover topics from popular songs and poetry to politics and education. 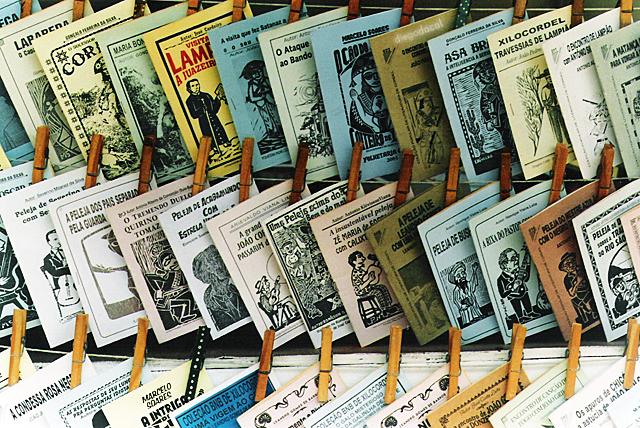 This format for spreading a message quickly and cheaply has been used in social and political movements across cultures (chapbooks in Europe and papel volante in Portugal). The invention of printing played an instrumental, disruptive role in human society. It democratized literacy, information, and education. These pamphlets are just one of many examples of how printing gave us the power to communicate and share with the masses. Like print, social media has become the tool for disseminating information quickly and inciting social movements. Our online posts are our modern-day “pamphlets,” and hashtags are a way to organize our messages into a movement that others can easily follow, find, and share. Here are some examples of how different people and groups have made their messages travel using social media and hashtags. 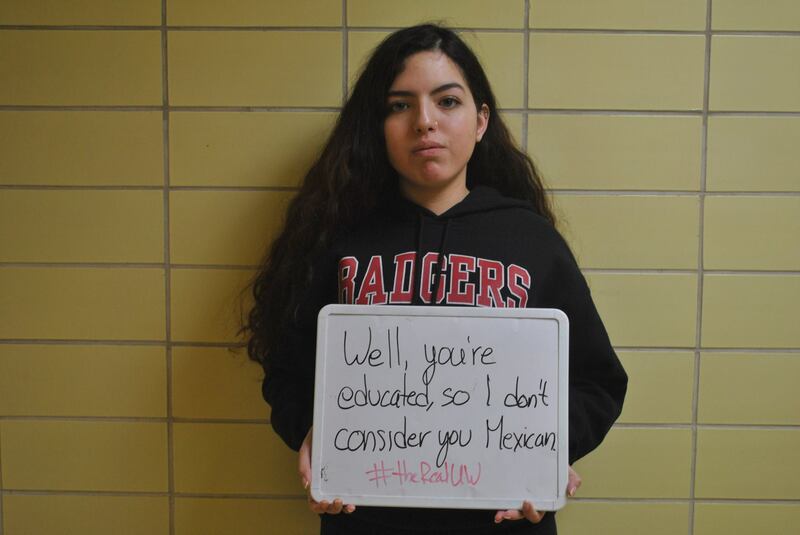 #TheRealUW is a hashtag that UW-Madison Athletics created, but after three racial hate incidents occurred on campus in March towards students of color, outraged students usurped #TheRealUW hashtag to point out the racial problems on campus that the school has not addressed. If you Google #TheRealUW the top search results all have to do with race and the students’ movement. Photo courtesy #TheRealUW Facebook page. These were also exhibited at the Chazen Art Museum. I’m listening to our students at #therealuw. Thank you for sharing these difficult stories. 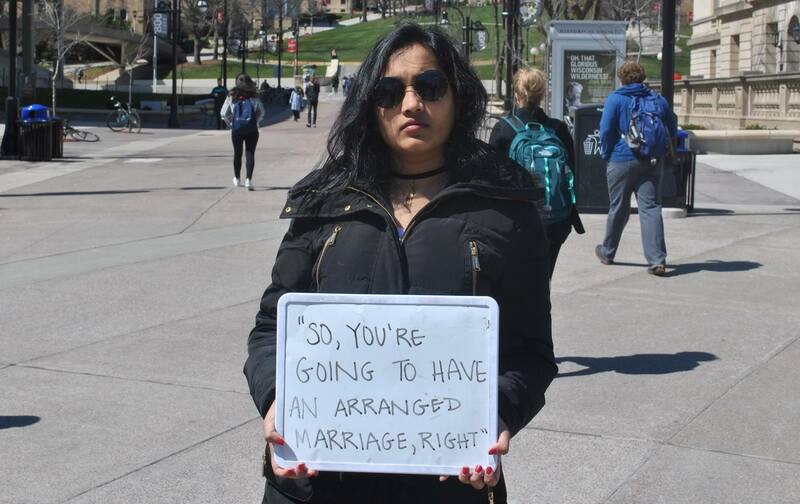 Your openness will educate and make UW better. A mother shared the above Facebook Status when Trump’s claim that he would ban all Muslims scared her daughter that their family would be deported. 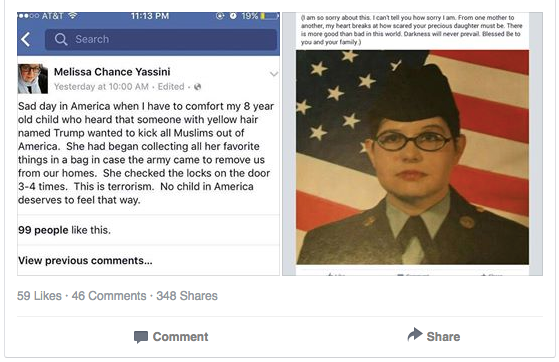 The status went viral, and military veterans responded with the following messages and the hashtag #IWillProtectYou. Technology is undoubtedly powerful. 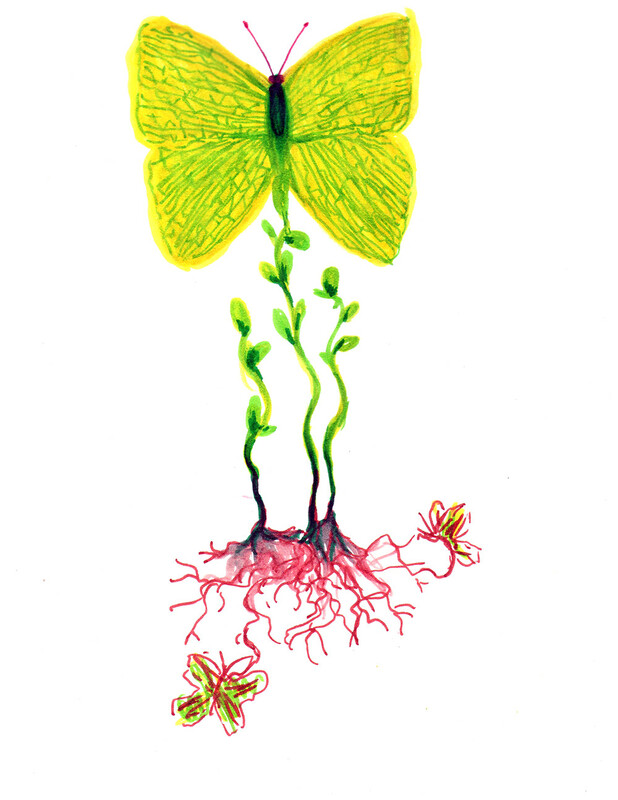 How can we harness this power effectively, ethically, and meaningfully? How can we use it not only to drive our own ideas, but also empower others to ask good questions and imagine new possibilities? For further reading on our use of social media, check out this article on how Social Media was used after the Paris attacks and ways to build a caring community. 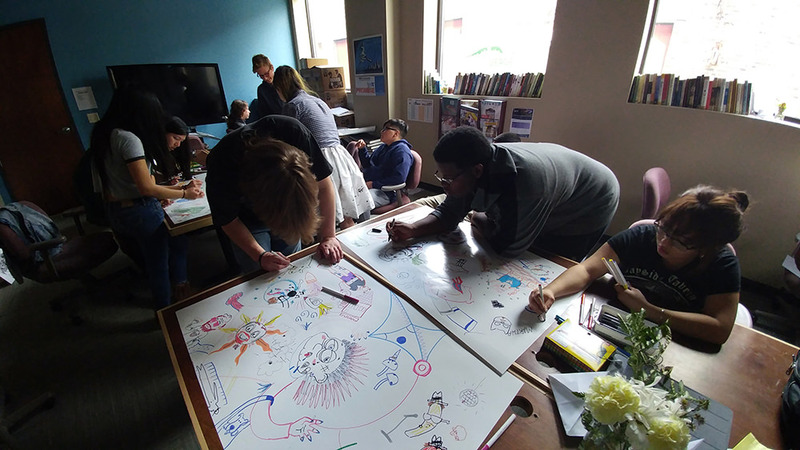 Escuela Verde designs its courses around project-based and student-led learning. Immigration is a salient–and sensitive–topic in our current political and social climate. It’s something that impacts many of us directly, as first- and second-generation immigrant families, as the members of families that include both documented and undocumented relatives. 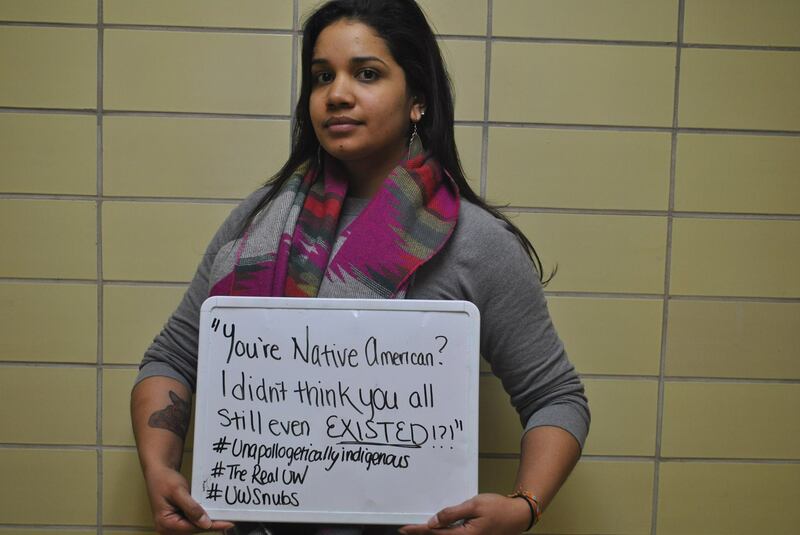 And while many people in the U.S. have been here for generations, the vast majority are the descendants of immigrants who also migrated in search of opportunities and a better life. Together as staff and students, we set some expectations upfront to guide our conversations and concepts. Immigration isn’t new, and it has always been necessary in the development and progress of human societies, culturally and economically. It isn’t unique to humans, either. 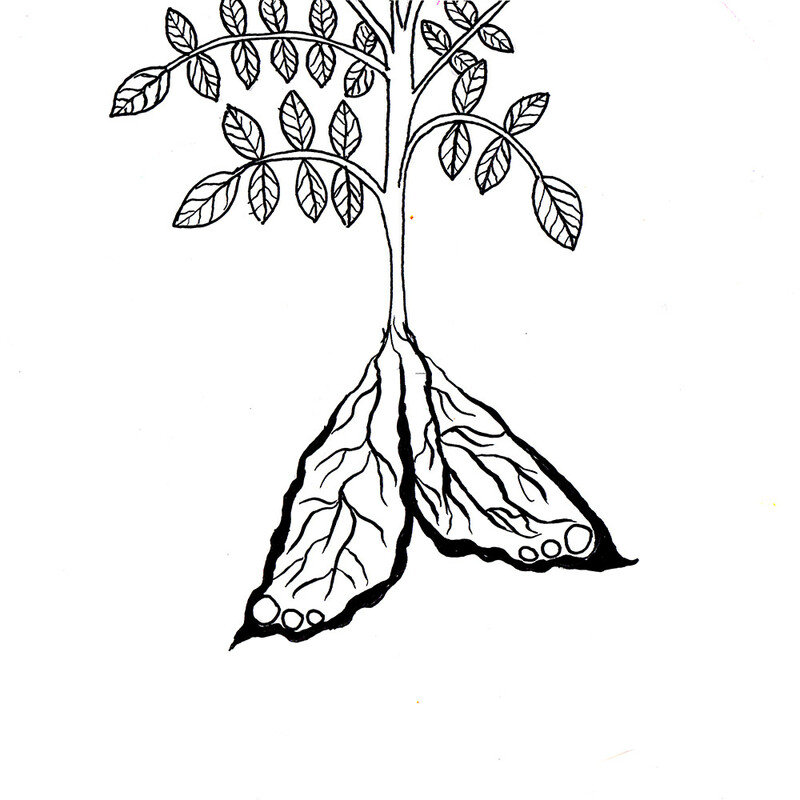 It has always been a means for growth, development, and the renewal of the resources we depend on. So if we know this, how can we write our policies to facilitate the benefits of immigration, rather than hinder our progress, or worse, divide us and further drive our inequities? 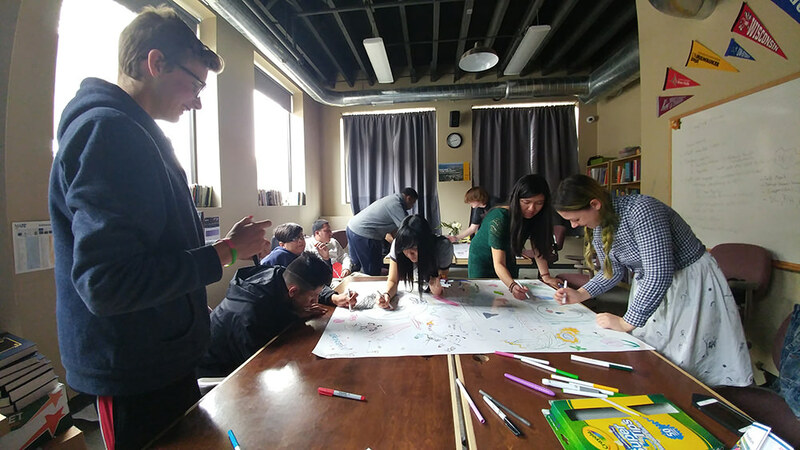 To better understand this subject matter, we spent some time talking about the different effects of immigration, and the positives and negatives that come with those effects. 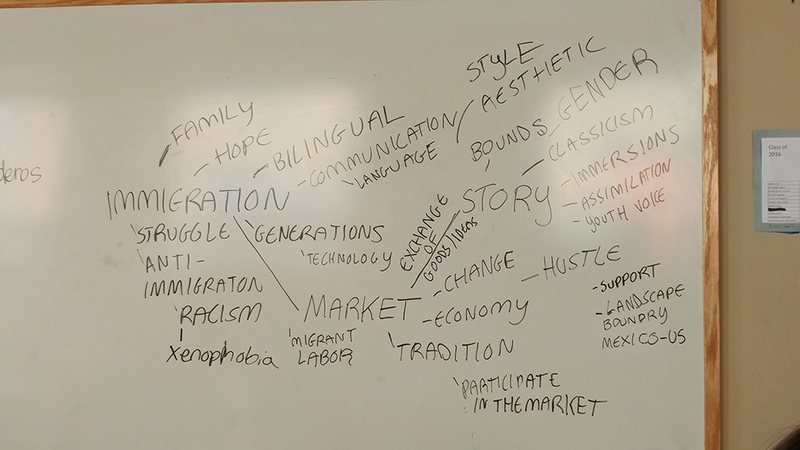 Our brainstorm web on the concept of immigration. 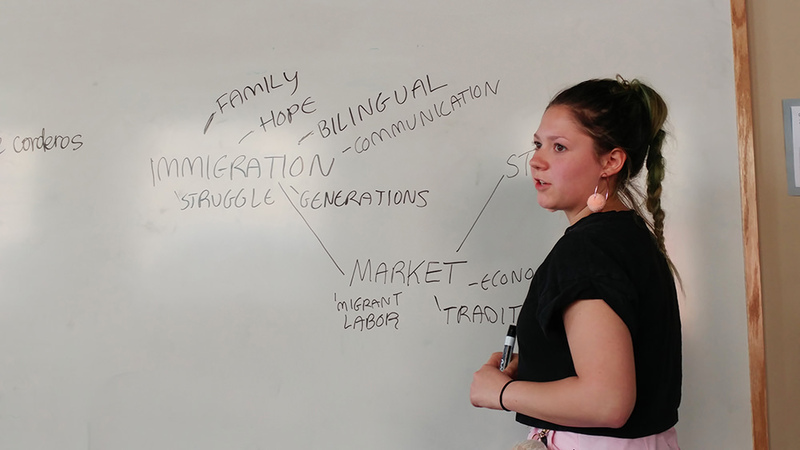 Gabriela Riveros at the whiteboard during our discussion of the topics related to and influenced by immigration. For one of our workshops, we asked students to bring in immigrant stories. They could be stories from their own families or from their neighbors. 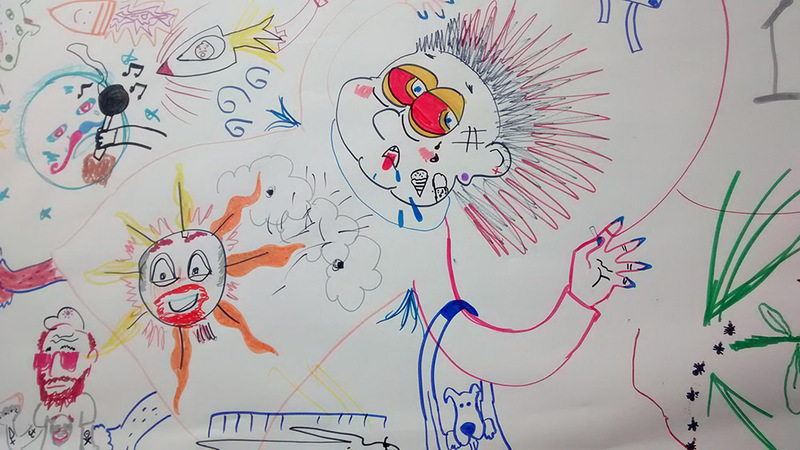 Here are two drawings that show some of the common themes that emerged from our story sharing. 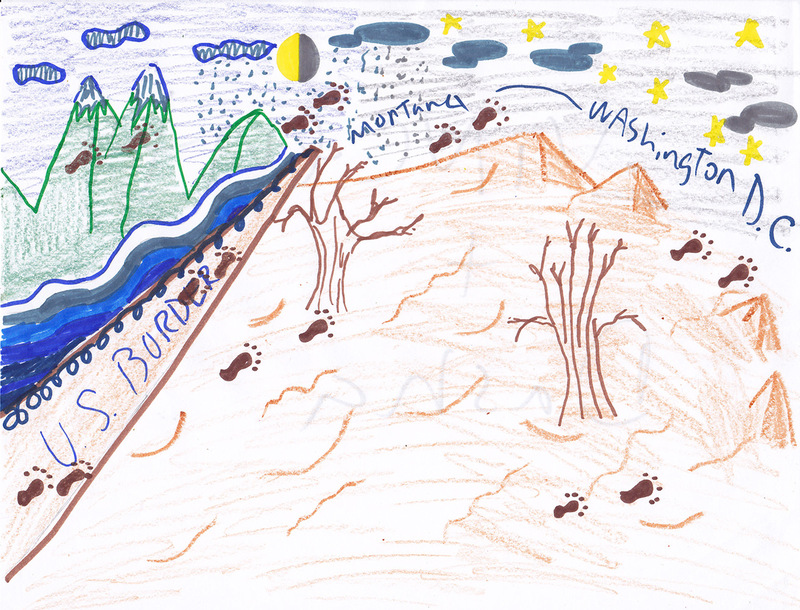 A student’s depiction of his Irish ancestors being denied to enter the US. His family instead went to Canada and crossed the border illegally, settling in Montana.